Giclee Prints and cards available from original artwork (now sold). 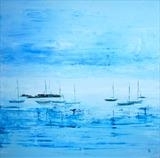 Kathryn Loveluck is an emerging artist in St Ives, originating from Sth. Wales but having spent most of her life in Bristol where she attended Art College and gained a BA (Hons) in Fashion and Textiles. Since moving to St Ives in 2003, she has concentrated on painting the landscape being inspired by boats, water and of course the moody West Penwith landscape in all it’s fabulous glory. 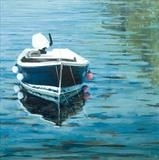 The sea is a huge draw and influence in her work along with all kinds of boats and how their shapes play on the water. Prints can be made from most work, either on paper or canvas, to size of your choice. Contact Kathryn if you are interested. Kathryn also makes her own necklaces and earrings from semi-precious stones such as Lapis Lazuli, Magnasite, Jade and many more. Each piece is individual and examples can be seen in her portfolio. Contact her for more details. Prices are from £48 to £120 for necklaces and £15 - £30 for earrings depending on stones used and complexity. All jewellery is made with sterling silver fittings and beads. 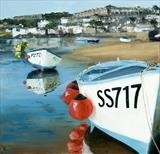 Kathryn's work is on permanent display at Back Road Artworks, Back Rd East, St Ives, TR26 1NW, tel 01736 791571.